by luck of a trade of talents, a crew of vigorous fellows spent a long day here murdering, exhuming, and eradicating the sea of nasty, menacing weeds that took over what once was a casually woodsy and wild flower garden bordering my country house. to reward their hard work, i of course served them a tray brimming with sandwiches, cold drinks, spicy bbq chips and a trio of hershey bars. to me, these fellows are heaven-sent! the palette cleared of the obstruction of too many hours of dismal toil that i clearly am too old to do, i ran off to the nursery bright and early to fill the volvo with a first batch of perennials in yet another attempt to tame the wild earth. this is the view that sits just outside of my french doors, as in a daily view, as in a view that should inspire rather than reduce me to tears. the day to plant was sunny and cool, and boy, was i inspired. 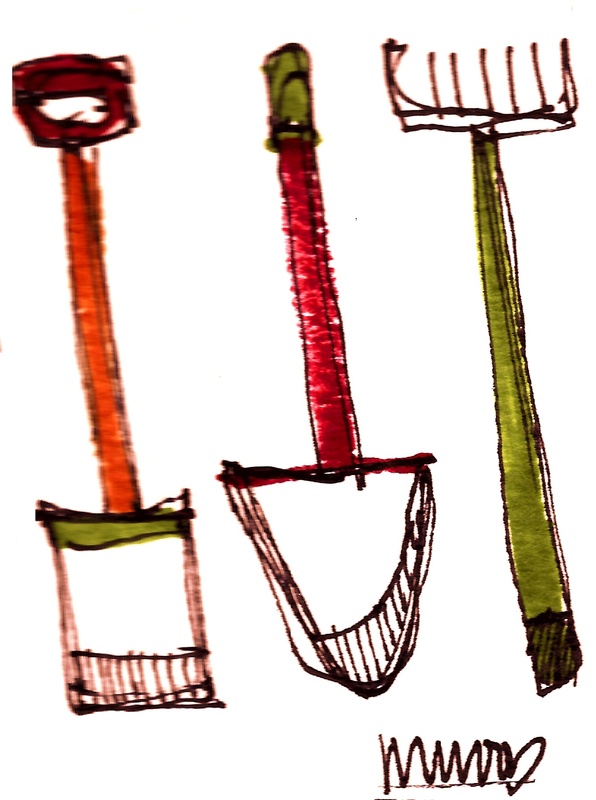 i had chosen my tools with care…walking over to the red barn to fetch a long handled spade, a strong-tined rake, and my pretty bright orange edger. i gave a little wave to my huge vegetable garden, letting it know that i’d be there soon enough…but first, i really needed to kick in some fragrant floral fun first. the fun of a family compound is that there is always an avid audience. my first visitors were a pair of white with black spotted pets: chin chin the cat perched on a few tumbled tree stumps (our idea of stepping stones, eschewing the too-tidy geometric ready to buy ‘stones’ that are frankly over my budget). she seemed peeved and not too mildly bored. astro, the really fat dog, dubiously guarded a spot of fresh soil where he had, the previous day, buried a perfectly good soup bone. no worries, pal: it’s all yours. so, my solo system of planting and garden design is simple: carry the goodies, one by one, from the back of the car, and plop them down in various positions on the beautifully fresh black soil of flower garden canvas. standing back, i’d eye the groupings, rearranging pots as i saw fit, until i was satisfied with the families of color, texture and fragrance that were sure to burst forth in a few weeks of watering and sunny shiny days. i’m sure my inspiration came from the saturdays of my childhood. after spending seeming entire weekends at d. hill nursery, my parents would arrange to have a barn-load of trees and shrubs delivered. building a house on a former indian river bed-cornfield-early settler farm, our property was ringed with old oak trees and ancient elms, and nothing in-between. so, the fun part came when my parents would stride out to the huge yard and start ordering their five kids around. as in, “lizzie, be the birch tree, go stand over by the pool…john, you’re the blue spruce, go over there by the kitchen door…matt and mary, stretch out your arms and go behind johnny, you’re the white pines…” and on and on we’d go, statue like, the wood children appropriately playing the parts of young trees that would soon enough be rooted and thrive on the five acres where we’d all grow up, my parents settle for their entire lives, and my children and i eventually build our own house to add to the family compound fun of generations on the same soil. back to the task at hand, as so many of the moves i make here where i live mimic and conjure up incredibly vivid memories, i look over my tools and choose the pretty edger for both it’s lovely color, and also it’s handy handle…just the thing to help me get this job done. digging away, i’d managed to plant half a dozen perennials before another visitor happened by. settling cozily on my wide deck in an adirondack chair, a steaming cup of coffee at her side, my cute mom waxed on the loveliness of the scene. quoting several poems memorized as a youth, she took a break to ask me, “wouldn’t you rather use a spade with a point?”. i looked up and smiled, at this point, a bit winded from crouching amidst a pile of dirt, crumbling bits of it in my gloved hands, patting down the soil and tucking in my azalea plant. “i’m good, but thanks”, came my speedy reply. a few more poems recited aloud as i moved on to the “deer resistant” little low-spreading evergreens, squinting my eyes to envision their color and texture against a few of the round wooden tree trunk disks that formed a path through what would eventually be a lush gorgeous field of flowers and fauna. out of the garage stepped my cute dad. he had some chore of his own on his mind as he approached his car, but first stopped when he noticed his wife, my cat, my dog, and his daughter. the latter: covered in mud. it does take a village. it really does. one big happy village.